A perfect anytime cake infused with coffee flavour topped off with cream cheese and a generous amount of chopped walnuts. This Coffee Hot Milk Cake with Cream Cheese and Walnuts is easy to toss together and taste great on its own. A recipe shared by home baker Javier, who is passionate and enthusiastic about baking and loves to share simplified recipes on his website. 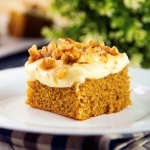 A decadent cake infused with coffee flavour topped off with cream cheese frosting and a generous amount of chopped walnuts. Coffee is a must for some people. But for those whose drink of choice is water or tea, you'll love this cake for its nutrient pack benefits! Other than the excuse to get more caffeine in your day-to-day routine, the nutritional aspect comes from the caffeine as well as the walnuts. Caffeine is found to lower the risk of heart problems and liver disease. Walnuts on the other contain good fats, vitamins and minerals which are good for both brain health and function. 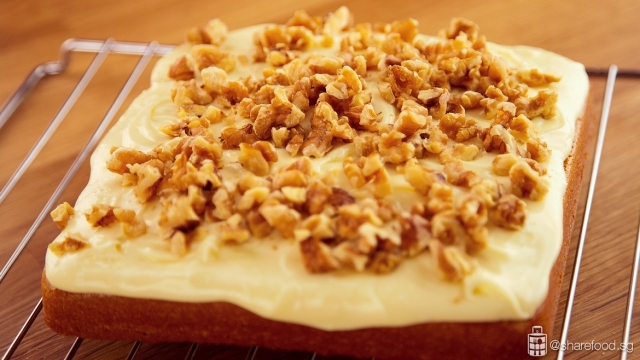 Simple moist coffee cake topped with delicious cream cheese and piled high with walnuts. Here's how to make it. First, we prepare the hot coffee. In a saucepan, heat butter, milk and instant coffee powder. Stir till coffee powder dissolves and butter has melted. Next, we start with preparing the cake batter. Place beaten eggs, sugar, salt and vanilla essence in a mixing bowl. Beat till sugar dissolves. Add in the flour, baking powder and 1/2 portion of the hot coffee milk. Beat on medium. Add in the remaining of the hot coffee milk and beat till batter thickens slightly. Line the baking pan with parchment paper and pour batter in. Drop the pan gently to remove excess air bubbles. Transfer to the oven and bake for 30mins. 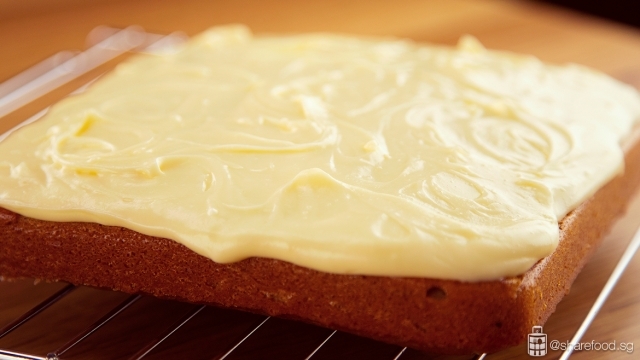 Spoon a generous amount of cream cheese frosting onto the cake. Whisk cream cheese, butter and vanilla extract with a stand mixer. Add in icing sugar in portions and beat till mixture is well incorporated. 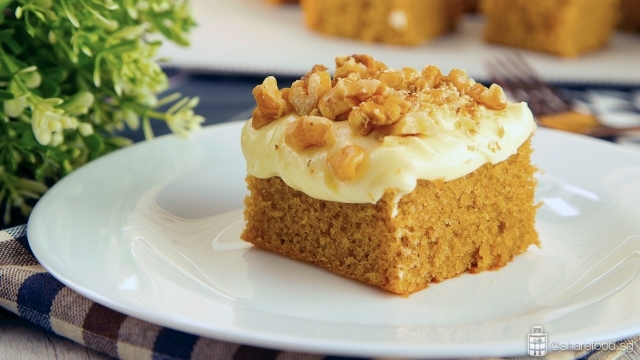 Spoon a generous amount of cream cheese frosting onto the cake and pile on chopped walnuts. Want to finish it off fancy? 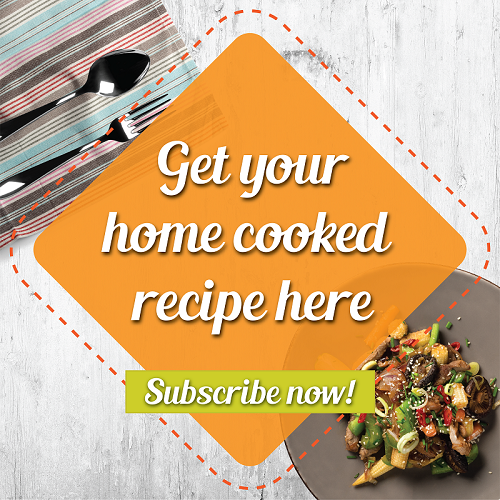 Add on chocolate drizzle or even a soup of your favourite icecream on top. A slice of this cake with tea, coffee or even juice would be amazing. Want to finish it off fancy? Add on chocolate drizzle or scoop of your favourite ice cream on top. Whatever you add on, it can only get more delicious! A perfect anytime cake infused with coffee flavour topped off with cream cheese and a generous amount of chopped walnuts. 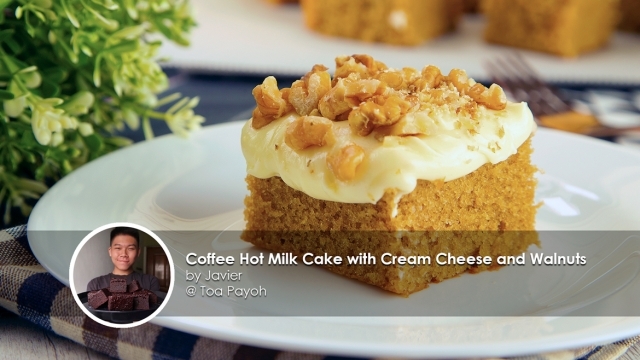 This Coffee Hot Milk Cake with Cream Cheese and Walnuts recipe is shared by home baker Javier. In a saucepan, heat butter, milk and coffee granules on medium-low heat. Stir till all the coffee granules have dissolved and all butter has melted. In a mixing bowl, add in beaten eggs, sugar, salt and vanilla extract. Beat on speed 3 till sugar dissolves. Pour a ½ portion of the hot coffee milk. Beat on medium speed to dissipate the heat. Once it has cooled down slightly, pour in the remaining hot coffee milk. Beat to mix evenly and batter thickens slightly. Preheat the oven at 160oC for at least 10 mins. Line the square pan with parchment paper. Pour the mixture into the pan. Drop the pan gently to remove the excess air bubbles. Insert into the middle tray and bake for 30 minutes. To check whether it is fully baked, insert a toothpick in the middle of the cake. If the tooth pick comes out clean, it is baked through. Remove from the oven. Let it cool down on the wire rack. Add cream cheese, butter and vanilla extract into the stand mixer bowl. Whisk the mixture evenly. Add in icing sugar gradually in quarters/portions. Beat till sugar is well incorporated. If you prefer a more fluid consistency, add in milk gradually and whisk evenly. 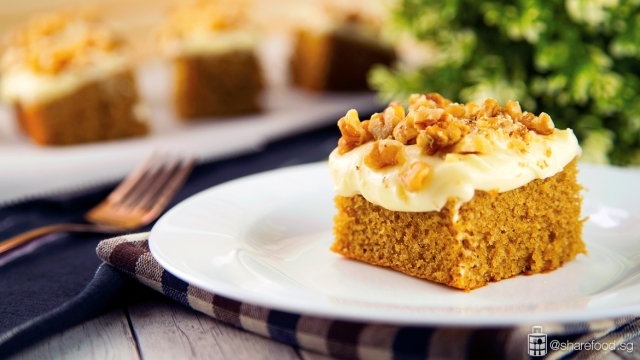 Spoon cheese frosting onto the cake and sprinkle generous amount of chopped walnuts.